Getting a better score on the SAT is mostly about attitude. That’s according to my recent student Kayla. She raised her score 320 points, and if you watch the video, she tells you straight out. Here’s her mom’s take on it. I don’t know about you, but I think that’s pretty cool coming from a girl who’s not yet 17 years old. It didn’t surprise me that her mom talked about it in my interview with her, but I had no idea what Kayla would say, and I have to say it was a little unexpected. Not because it isn’t true. It is. We all know that a positive mental attitude is essential for success. Most of us have been told many times that we have to improve our attitude. Not only have we heard it from our own parents and teachers and bosses, but there must also be hundreds of books and CD’s and seminars that tell people the same thing. So if everybody knows this, why is a positive attitude so hard to come by? If we could just take a positive pill every morning and have a positive attitude all day, I think everybody would do it. Unfortunately there is no pill, so what do we do instead? Here’s the key. Attitudes come from our expectations. If we we expect something bad to happen, we tend to have a negative attitude. If we expect something good, we tend to have a positive attitude. 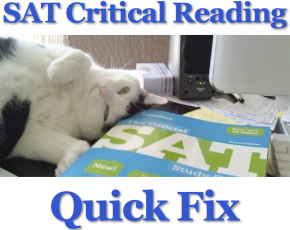 So a student’s attitude toward the SAT, and therefore studying for it, is directly related to whether he expects his efforts to pay off. That’s where I come in. My expectations of my students’ success is just as important as their expectations of themselves. In fact, I’m able to successfully transfer my expectations to them because I’m able to relate to them in such a way that they believe me when I tell them that they’re going to do well. The key is to quickly determine a student’s potential and take him through a process where he can experience it for himself. Then it’s just a matter of working with him until he achieves it, which is easy when he has a positive attitude. Thank you so much for your post! After registering for the Test in May, just one month to prepare everything, i almost cried out because of pressure! I am an exchange student for a year and i plan to come back to US for college, and SAT is the key for admission and financial aid. I will try my best and have a positive attitude! Thanks for the note, Lily! Good luck on the test. I think you’re gonna do great!